Getting lost can be frightening, confusing, and upsetting. Most of us have experienced it, and some avoid new and unfamiliar places as a result. If we take our time, however, plan our routes, use available tools, and learn or relearn a few new skills, we can navigate the world with confidence and success. 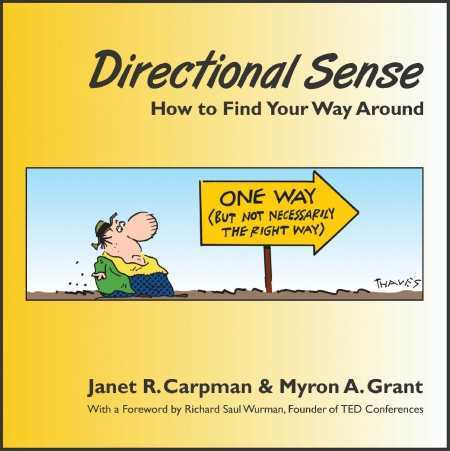 In a work that is timely, well organized, clearly articulated, and vividly illustrated, professional wayfinding consultants Janet Carpman and Myron Grant offer a step-by-step, easy-to-use book on directional planning for people who want to maintain and gain navigational independence. This helpful volume will be an asset to readers of all ages, abilities, and challenges who want to successfully find their way to, from, and around all kinds of places and environments. As the authors aptly note, “Knowing how to find your way around reduces stress, makes you safer, enables you to be more independent, and saves time, energy and money.” The duo writes with over thirty years of consulting and planning experience and are the award-winning authors of an earlier volume, Design That Cares: Planning Health Facilities for Patients & Visitors. In chapters one through three, Carpman and Grant put readers at ease by addressing concerns and challenges all people have in navigating new spaces and places, speaking alike to those with physical and cognitive challenges and to those “born with no internal compass.” Illustrations, photos, and cartoons offer visual validation and humorous assurance that those who get lost are not alone. Teachable techniques shared in chapters four to nine include “Six Learnable Wayfinding Skills” that consist of Deciphering Wayfinding Words and Numbers; Comprehending Spatial Layouts; Reading Maps; Following Signs; Recognizing Landmarks; and Asking Directions. Chapter ten, “Taking Advantage of Everyday Wayfinding Technology,” introduces GPS and navigational systems for users of cars, mobile phones, and computers. Chapter eleven, “Using Good Directional Sense,” suggests how people of all ages, abilities, and disabilities can safely find their way in the world. Among the authors’ concrete suggestions are these valuable tips: Allow extra time; plan routes in advance; ask directions; travel with others; adopt a sequential wayfinding style; memorize routes; accept that you can’t always point North; expect wayfinding system shortcomings; and try wayfinding technology. In an era of increasing sensitivity to the challenges of aging, health, ability, mobility, sensory differences, and cognition, Carpman and Grant’s book shows how to maintain or gain personal independence in perambulation and travel. It is a highly recommended educational and practical resource for all ages.